Kiden Jonathan from South Sudan talks about her journey in her brown boots. Kiden and her children spent several years in a refugee camp. She knew she wanted a better life but didn’t believe it would ever happen. After years in the refugee camp and working odd jobs Kiden is now working as a writer and a public speaker and has trained as a nurse. You have to believe you can do it or else no one else will. She was one of a dozen women from all over the world came to tell their story, sharing personal and emotional memories at the Shoe Project. 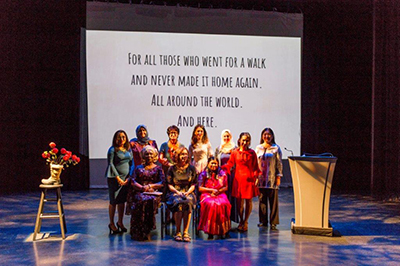 The Shoe Project is a writing and performance workshop in which immigrant women tell their stories about their arrival in Canada. This project started in late 2015 and was created by novelist Katherine Govier and held at the Bata Shoe Museum in Toronto. Since then the Shoe Project has been expanded across Canada. In 2017 performances in January took place in Calgary , Alberta in June, Halifax in September and Toronto in November. Umut Duygu Uzenel from Ankara, Turkey told the audience she graduated in medicine in 2000 and specialized in ophthalmology at Aegean University. Umut came to Canada in 2017 as a refugee, but before that she went to Africa to help in hospitals. Three years ago a woman came to the clinic for help with her eyes. She had lost one of them accidentally in her childhood and the good eye had a white cataract. 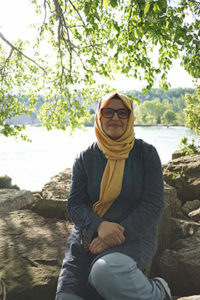 Umut knew the procedure would be dangerous but decided to operate anyway, and she says, thank God it was a success and the woman was able to see. Her shoes were orthopaedics, specially designed and expensive. They give her support to go to different countries and help give children and adult the opportunities they didn’t have before. Umut means hope, which is what she gives patients when they come to her for help. She has performed more than 10 000 eye surgeries since 2005, and published 30 national and international research papers. You can go see more of these women when you visit the website www.theshoeproject.com .